Who doesn't enjoy a good old fashioned Chinese kung fu movie! Warriors floating through the sky and jumping from trees never gets old. Though those are fun to watch, it is even better to have your own unique Chinese kung fu poster scroll hanging in your room. This can inspire you to practice your own moves so that you too can walk on water. 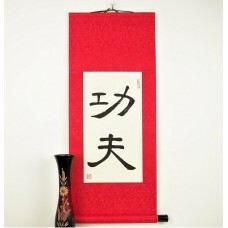 Our kung fu scroll like our other Asian gift items, is hand painted. The strokes are bold and smooth, indicative of the power the kung fu warrior has within. 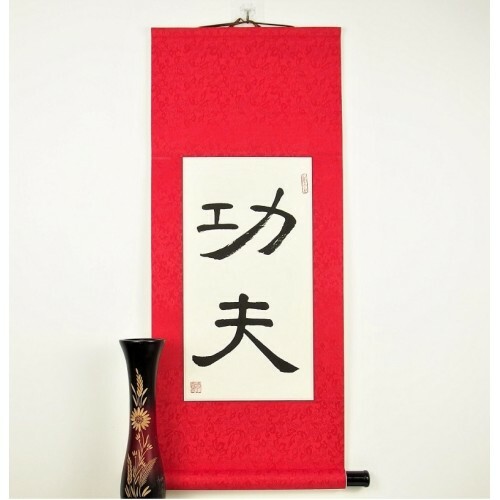 Our kung fu scroll is excellent for hanging in a dojo or giving to a fan of kung fu movies. The silk is available in many different colors, each with its own unique decorative design. Gong Fu calligraphy scroll. These characters are pronounced "gong fu" in Chinese, but have been transliterated as "kung fu" in English. This is the most famous Chinese martial art and has become popular around the world. Many famous movies and movie stars employ gong fu. If you are a kung fu fan, this is the scroll for you! Every item will be sent with its own tracking number.